Which TV news anchor is your favorite? According to the Wrap's new Q Score survey, CBS' Scott Pelley is the most-liked news anchor, while Chris Matthews falls in last place as the least-liked newscaster. 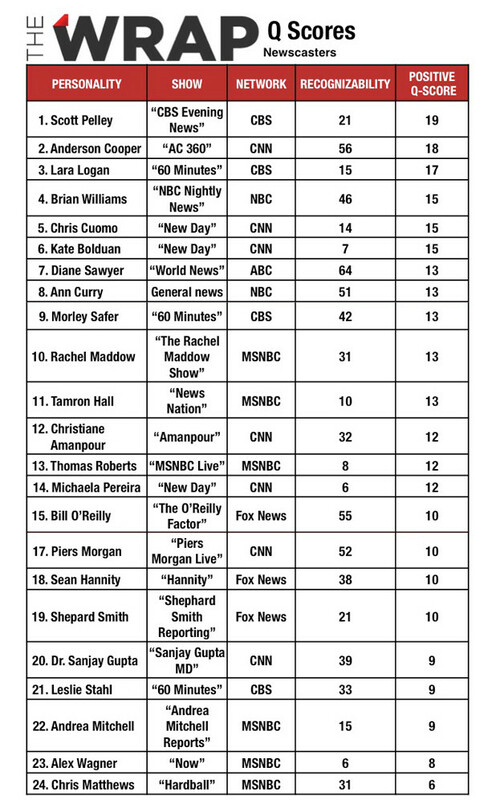 The study, which measured the popularity of 24 top news anchors, showed CBS' evening news host Pelley beating out CNN's Anderson Cooper by just one point. Cooper still tops the list in one category however-- he is the most recognizable male newscaster on TV. More than 1,800 viewers were asked to identify each anchor and say whether or not they like him or her. Despite being suspended from CBS News after airing an erroneous Benghazi report in November, "60 Minute's" Lara Logan was the third most-liked newscaster and the #1 most-liked female anchor. NBC News' Brian Williams and CNN's Chris Cuomo came in just behind Logan as the fourth and fifth most-liked, respectively. At the very bottom of the list was "Hardball" host Matthews, whose ratings have suffered in recent months compared to his competitors on CNN and Fox News. While the MSNBC host's recognizability score was fairly high, his likability score was the lowest out of his peers. MSNBC's Alex Wagner was hanging on just slightly above Matthews, but she was ranked the least recognizable face among the 24 anchors. NOTE: The Wrap's chart above appears to omit #16. The correct order should be #15: Bill O'Reilly, #16: Piers Morgan, #17: Nancy Grace and #18: Sean Hannity. You can find a slideshow with the full list, including Nancy Grace, here.